The map becoming the territory. 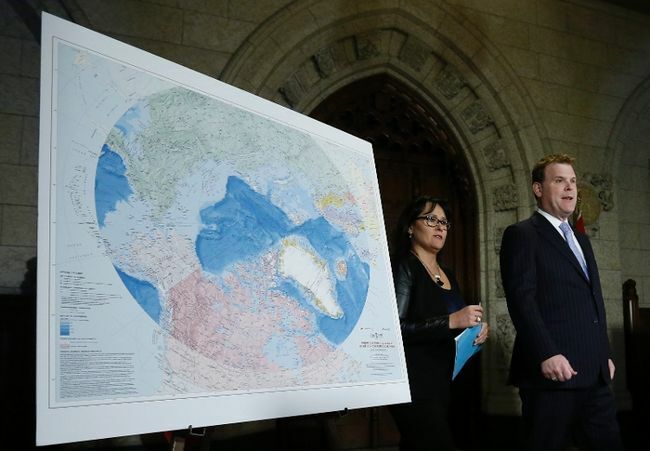 FM John Baird and Minister of the Environment Leona Agglukaq stand in front of a map of the Arctic as Canada unfurls its continental shelf claims. © REUTERS/Chris Wattie. “We do not give up the North Pole. Canada’s claims to the North Pole are no more than ambition.” So declared Russian polar explorer and scientist Artur Chilingarov on December 11, whom President Vladimir Putin named a “Hero of Russia” after he famously planted his country’s flag on the seabed underneath the North Pole in 2007. For years now, Russian scientists and officials have been trying to do the same thing. In 2007, before descending in the submersible to the Arctic sea floor, Chilingarov remarked, “The Arctic is Russian. We must prove the North Pole is an extension of the Russian coastal shelf.” Thus it appears somewhere between his statements in 2007 and 2013, the North Pole became a part of Russia, since he is now saying that the country won’t “give [it] up.” Whether or not there is a scientific basis for the North Pole to form part of the Russian continental shelf, it has long been a part of the imagined territory of Russia, and indeed the USSR, which claimed the area extending from Russia’s northern coast all the way up to the North Pole . So why are Canada and Russia seeking to claim the North Pole? But that $200 million was not really spent to secure future oil and gas resources. First of all, as The Verge’s Katie Drummond notes, it will take the UNCLCS decades to get to Canada’s claims, since it reviews an average of four a year and has a backlog of 40 claims. By the time the commission takes a look at Canada’s claims, and by the time Canada gets around to arbitrating the limits of the continental shelf with fellow claimants Russia and Denmark, the Arctic could very well be a drastically different place. By mid-century, for instance, the Arctic Ocean is anticipated to be completely ice-free during the summer, with trans-Arctic shipping routes crossing over the North Pole. (Note: the continental shelf claims do not affect jurisdiction over the waters above, which will remain open to international shipping.) Not only that: by mid-century, it’s possible that the global energy mix in 2050 could be substantially different, too, although oil and gas will likely still be in high demand. The World Energy Council predicts in a report published this year that in 2050, fossil fuels will constitute between 59% and 77% of the world energy mix, depending on whether governments focus on affordability or sustainability in energy usage. In either case, whether the technology and price per barrel will make drilling in the remote and inaccessible Central Arctic Ocean economically feasible is still far from certain. Additionally, the Arctic Ocean isn’t getting any smaller, so drilling in and around the North Pole would still be taking places hundreds of miles away from the nearest facilities on land. Furthermore, as the USGS has found, most of the offshore oil and gas in the Arctic Ocean likely lies within a couple hundred miles from shore, thereby falling within the extended economic shelves – and not in the middle of the Central Arctic Ocean (though other resources, such as minerals like scandium, could well be there). The area that Canada intends to claim also has a low probability of having oil, as the USGS map below shows. 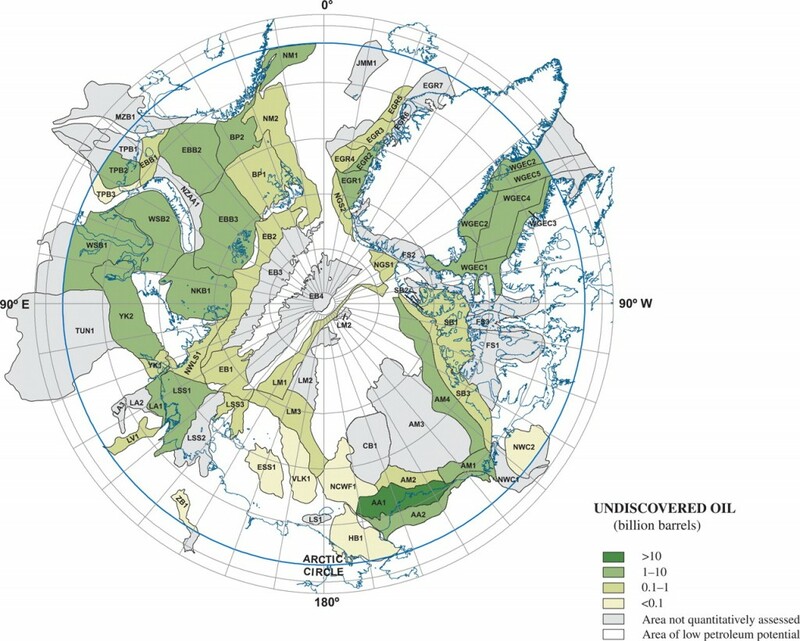 USGS Map of Undiscovered Oil in the Arctic. With Stephen Harper and Vladimir Putin more likely making moves in the Arctic with a view to the next election rather than the price of oil in 2050, the consideration that North Pole claims are primarily for national pride and international one-upmanship must be assessed. Pprofessor of Southeast Asian history Thongchai Winichakul coined the neologism “geo-body” in his book Siam Mapped to describe the “effect of modern geographical discourse whose prime technology is a map” (1994, p. 17). Governments use cartographic technologies in “thinking, imagining, and projecting the desired realm” (Winichakul, 1994, p. 130). Nowhere is this clearer than in the allegation by the Globe and Mail that Canadian Prime Minister Stephen Harper “ordered government bureaucrats back to the drawing board” after learning that the proposed claim to the continental shelf did not include the North Pole. If this is true, then Harper is basically demanding that the science be made to fit the desired boundaries of the nation. To paraphrase French philosopher Henri Lefebvre, the map has come to precede the geographic territory. It is fitting, too, that Leona Aglukkaq, Minister of the Environment and Chair of the Arctic Council during Canada’s 2013-2015 chairmanship, stood aside Baird as he announced the country’s claims. Aglukkaq is of Inuit descent, and the Canadian government effectively once used the Inuit as “human flagpoles” in the Arctic . Neither Aglukkaq nor the Inuit play such objectified roles anymore. Yet at the same time, indigenous presence and usage of the Canadian Arctic remain central to the country’s claims. Just as Canada – the “True North Strong and Free” – perceives the North Pole to be rightfully Canadian, Russia views the North Pole as part of its own legitimate territory. 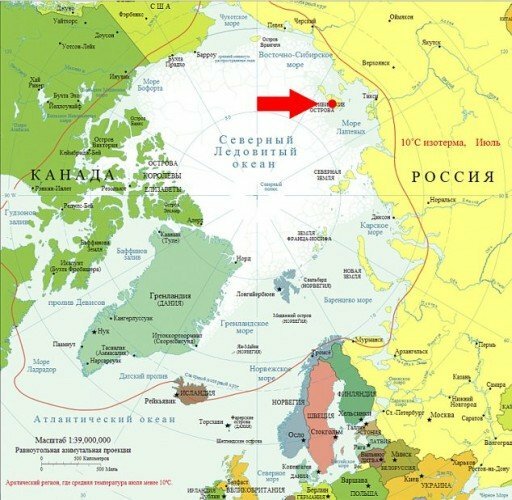 The recent journey of the Olympic torch to the North Pole on board the Russian icebreaker 50 Let Pobedy clearly inscribed the top of the world into the Russian geo-body, particularly since the rest of the relay is taking place within Russia’s national boundaries. The North Pole (and equally outer space) were therefore not so much international stops along the relay as domestic stops. Denmark has a dog in the fight for the North Pole, too, but since the country would be claiming the Lomonosov Ridge through Greenland, which is becoming more independent every year, and since Denmark is already so small, the Danish territorial imperative to ensuring that the North Pole ends up with a red and white crossed flag on top is actually weaker. The day after Canada made public its claims to its continental shelf in the Arctic, Putin announced in televised remarks at a meeting of the Defense Ministry Board, “I would like you to devote special attention to deploying infrastructure and military units in the Arctic.” He also discussed the government’s plans to rebuild runways on the Novosibirsk Archipelago (New Siberian Islands), abutting the Northern Sea Route between the Laptev and East Siberian Seas. Putin argued that these islands “have key meaning for the control of the situation in the entire Arctic region.” These plans were initially released in September 2013, and the meeting, too, had been scheduled long before John Baird’s announcement. Yet the gathering of the Defense Ministry Board provided an opportune moment for Putin, who has even more of a penchant for showboating in the Arctic than Stephen Harper, to respond publicly to Canada’s statements about the North Pole. He would not miss a chance to let anyone forget that Russia is continuing to beef up its presence up north – even as the countries work together in the Arctic Council. Putin is correct in saying that the New Siberian Islands are important. They, along with other bottlenecks in the Arctic such as the Bering Strait and the GIUK (Greenland-Iceland-UK) Gap, are in fact more strategic for controlling the region than the remote North Pole in the middle of the ocean. We should therefore pay attention to state actions in and around these bottlenecks rather than to political posturing for more arbitrary points on the map. Still, Russia and Canada will continue to wage a war of words over the North Pole, which holds an immense amount of symbolism for the never-ending project of constructing the national geo-body in both countries. The pursuit of the North Pole is therefore not about oil or minerals. It’s about territory and identity. Blinnikov, M. (2011). A Geography of Russia and Its Neighbors. New York: The Guilford Press. p. 11. Tester, F. and Kulchyski, P. (1994). Tammarniit (Mistakes): Inuit Relocation in the Eastern Arctic, 1939-1963. Vancouver: UBC Press. p. 114. Mia Bennett is pursuing a PhD in Geography at the University of California, Los Angeles (UCLA). She received her MPhil (with Distinction) in Polar Studies from the University of Cambridge's Scott Polar Research Institute, where she was a Gates Scholar. Mia examines how climate change is reshaping the geopolitics of the Arctic through an investigation of scientific endeavors, transportation and trade networks, governance, and natural resource development. 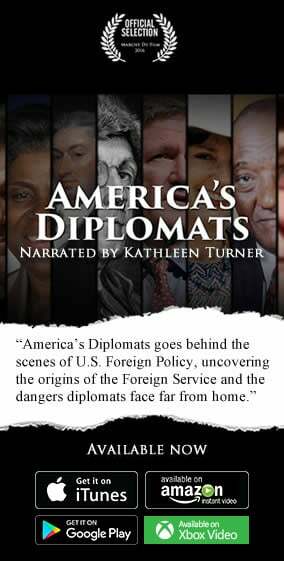 Her masters dissertation investigated the extent of an Asian-Arctic region, focusing on the activities of Korea, China, and Japan in the circumpolar north. Mia's work has appeared in ReNew Canada, Water Canada, FACTA, and Baltic Rim Economies, among other publications. She speaks French, Swedish, and is learning Russian.